Today we welcome author and prolific tweeter Liz de Jager to the blog where we talk about publishing, juggling a day job and those pesky characters that want to be heard. Liz is the author of Banished and Vowed from the Blackheart Legacy series. How long was it between finishing Banished and the release of it? About 3 years? I finished Banished…rewrote it from scratch (changed point of view to first person present tense) then sent it off to my agent, Juliet. We reworked it then sent it out to editors. Got the book deal with Tor in 2013 and then Banished got published February 2014. How do you juggle writing and your day job? I have to be strict. About 40 minutes writing before work in a coffee shop around from the office. At lunch time either an hour in a spare office or run off to another coffee shop. In the evenings from nine till around midnight and at least one full day of writing on the weekend or at least a four or five hour stretch, for sure. You have to make compromises but you always have to find time to write. What was the feeling seeing the first print of your book, with your name on it? Just incredible. You know in theory you’re going to have this completed thing in your hand but when they turn up, and you open that box and there they are, these beautiful things with your name on it? I don’t think there’s another feeling like it. As you write, do you have a set plan or is it very fluid? Banished had a firm premise. I knew I had to have around five big beats/scenes that I needed to hit. So I just sort of wrote until I hit them and then edited them into a tighter read. For books 2 and 3, there was far more planning, especially book 3, which is out January 2016. Lots of planning and making sure things are tied together. If you had to inspire other writers, what would you say? Don’t give up. Believe in yourself. It’s hard but it’s the strongest weapon in your arsenal. Also, read everything you possibly can, both in and outside of the genre you write in. Watch movies, watch TV shows, read newspapers. These are all places to generate ideas. Stalk your favourite authors, find out who the agents are who would be interested in your book. Visit your library and local bookshops and see what’s popular, form an idea what’s current and check out agents’ wish lists of books they’re keen on reading and selling. Also familiarise yourself with publishers – who’s doing what and who the editors are. It’s a very small community in reality and its fascinating learning the various facets. How naughty are your characters as you try to write them? They are THE WORST, literally. Like, Aiden (the werewolf boy?) he could flirt for days. I could literally write an entire book with him doing banter and flirting with boys and girls. I’ve had to rein him and Dante in quite a bit. How was it trying to maintain the pace and world building throughout Banished and Vowed? Pace is interesting because it depends on the type of story you’re telling. Both books are spread over a few days only so the pace is pretty damn fast. There is a lot of action and fighting to pack in…with the world-building, it’s really difficult because you want it to come across easily without making a big thing about it, pulling your reader aside and saying: listen, Bob, this is why my faeries can’t drink coffee, it makes them feel very frisky. It yanks readers out of the world and the story. Was Kit based on someone you know or built with a real personality for people to relate? Kit is wholly her own creation. She was just there, fully formed. A bit of a brat, a risk taker, someone who doesn’t really stop to think things through and even when she stops to think things through, she’ll usually go with the decision where she gets killed. She probably feels she’s slightly immortal because teens hardly ever think bad things can happen to them. No one is there to save her, she’s the one doing the saving and so that’s what she does. Her word is her bond and she will go to stupid lengths to carry it out. Having been a blogger yourself, how important is it for the world of books that people share their opinions? It is so important. Everyone’s opinion matters. You just don’t have to mean and antagonistic about it. As a blogger I’d been witness to so many bloggers / authors / publishers losing their cool online and it never reflects well on anyone, ever. In the end, we are all readers and we all love reading / movies / music / TV shows. We are a tribe of really cool people and there’s really no reason to go to war with one another about silly stuff. How do you see the series ending? Uhm. I’m working on the edits for Book Three – JUDGED – right now and lemme tell you a thing: its hard work because the way I thought the book would end is just not happening. It’s completely different and so much better. It made my agent cry. I have no idea what my editor thought about it yet as I’m working my way through it (it came in Monday past) but I think she’s far happier with it than what I had originally handed in to her. I had a tremendous time writing it and will be sad to say goodbye to the characters, but hopefully one day I’ll be able to dust them off and write more adventures. Or write adventures in the same world using other cousins or Spooks agents…or Fae princes…or werewolf boys who really should know better than following their noses for trouble! Thank you Liz for your time in answering these questions! 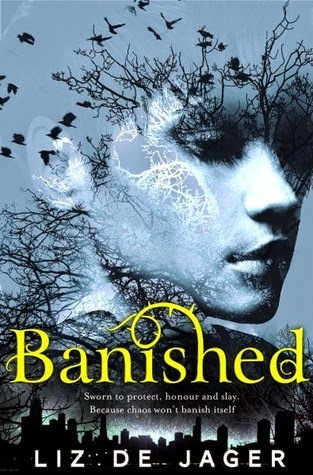 Banished, the first book in the series is available in ebook and print and my review of it can be read here. Previous Post The world of Pre-order.